Here's personal gear and three kayaks, Freya's (3-piece [S]explorer, 3-piece Rockpool, and 4-piece Qaannaq) bagged and ready for loading in the car (kayaks are in the five large bags), when we flew from Germany to Newfoundland last year to teach; the center section of the larger kayaks require a bag to themselves, and you can usually nest the bow and stern together in another bag. What we always did was to wrap each hull section with fitted pieces of closed-cell foam and tape them up, and then place in a large bag. Even so, minor cosmetic damage was frequent. 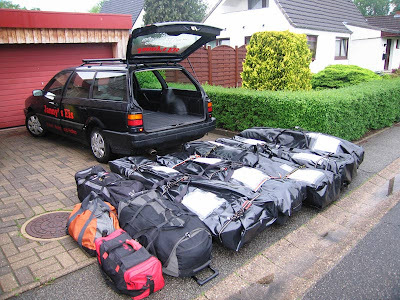 We packed lightweight/bulky gear inside the kayaks and weighed the bags at home to ensure that they did not exceed the maximum weight allotted for the airline.Freya had the large black kayak bags custom made at a local upholstery shop. Being black (what else do you expect from Freya? ;-) shiny, and large, we were often asked at airports, by people in hushed tones, if they were body bags. Maybe yellow would set a better mood...We used simple muscle power and airport carts to move them around but I did have one exasperating experience in Hamburg where I was trying to move all the bags shown in the photo from the curb to the ticket counter, while Freya parked the car. As I carried the first bag to the counter and turned to go back for the next one, a security officer demanded that I could not leave it and must bring all bags at the same time. I tried to explain that this would not be possible. Finally an American overhead the ruckus and kindly agreed to watch the bags as I went to get each piece at the curb, and the pile grew into a mountain.Flying with the gear is stressful. Some airlines don't transport kayaks at all. Some will transport them, but you have to massage the truth a bit and call them "surfing equipment". Expect long talks with baggage handlers and their managers where you are not sure what you are going to pay. Sometimes we paid over $200 a bag, sometimes the ticket agent was so flustered getting everything loaded that we were charged nothing at all. Sometimes you will pay one price going overseas, and a much different price when returning.